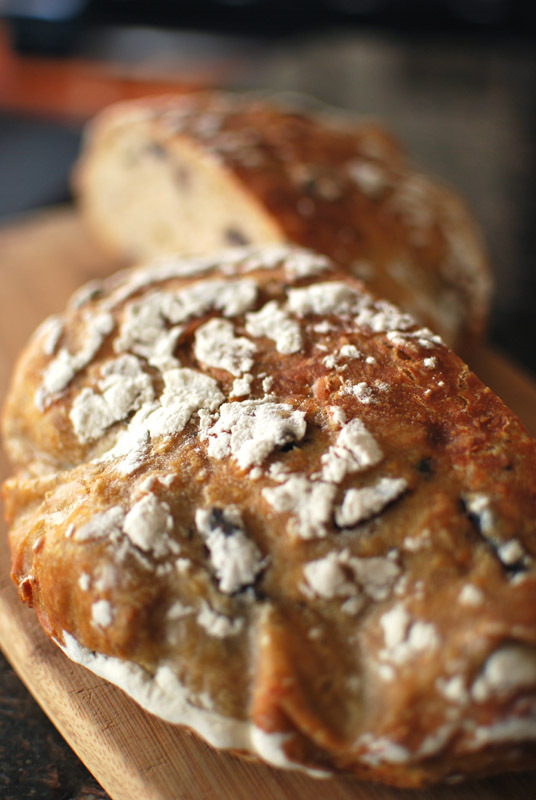 This last no-knead variation takes yesterday’s adaptation one step further: instead of simply adding different grains to subtly change the flavor, this version adds such generous amounts of parmesan and kalamata olives that the word “subtle” becomes truly ludicrous. The one caveat here, of course, is to make sure you use both cheese and olive of good quality; if you do, you will be rewarded with a loaf vibrant with rich flavors. Scrimp here, using that cardboard powder in the green-topped shaker or those poor black rings that emerge limp and pathetic from their can, and you’ll have insulted the very flour by suggesting it associate with such riff-raff. Lest you hear this description and think you’ll be spending more to make this one loaf of bread than you might on a reasonably-priced bottle of wine, let me reassure you that there are some very fine and inexpensive options here. While true Parmigiano-Reggiano would be exquisite in this application, the nuances of its delicate flavor would be a bit lost in baking; and besides, it often runs near $18 to $20 per pound. I suggest reserving this for grating over pasta, and seeking out something more like the nutty and buttery Argentine parmesan that my cheesemonger proffered, which cost less than half as much. Keep in mind also that this bread, while quite delicious when made as the recipe is written, tends toward the indulgent, and no real harm could come from reducing the measure of cheese to fit the budget. Better that than opting for an inferior cheese, I say. And, of course, good-quality olives may be bought in bulk at many grocery stores these days, at a reasonable price. You might even prefer the more concentrated taste of oil-cured olives, which taste like good olives turned up to eleven (meaning you can use fewer for just as much flavor punch). 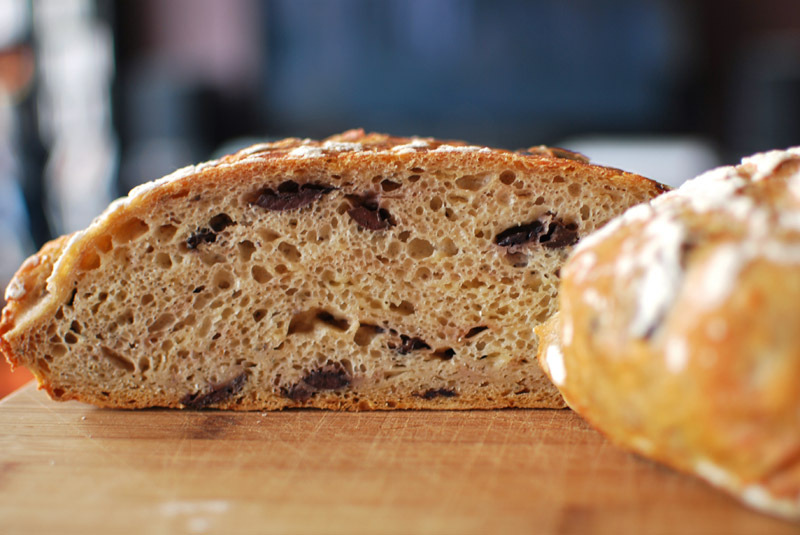 This loaf ends up with a delightfully open crumb, especially considering the heft of the olives and cheese that could both weigh the bread down and make it more leaden. The no-knead method, namely that long and gentle rise, gives the dough enough muscle to lift the added bulk with nonchalance. The crust is not too thick and leathery, nor too thin and unable to stand up to the olives. You’ll know that the parmesan is there not by sight, as the cheese melts invisibly into the structure of the bread, but by its unmistakable smell and taste. A hint of whole wheat flour adds a little rustic texture to the crumb, which helps the texture better match the additions of cheese and olive. Overall, this is a potent bread, and a great example of the no-knead method. I hope you all have enjoyed this no-knead week as much as I have; it’s been nice to not have to clean my mixer every day. 1. In a large bowl, whisk together the flours, yeast, and salt. Grate in the cheese, and toss to combine. Add the olives and water, and stir until blended; the dough will be shaggy and sticky. Cover tightly with plastic wrap, and let dough sit at room temperature for at least 12 and up to 24 hours (but preferably about 18). 3. Transfer the dough to the parchment-lined skillet, and dust heavily with additional flour (or wheat bran, if you like). Cover loosely with plastic wrap and let rise until doubled in size, about 2 hours. When it is ready, the dough will not readily spring back when poked gently with a fingertip. 5. Cover the pot with the lid, and bake at 500º F for 30 minutes. Reduce the temperature to 425º F, remove the lid, and bake uncovered for an additional 15 to 30 minutes, or until the loaf is well-browned. An instant-read thermometer should register around 205º to 210º F when fully baked. Transfer to a wire rack to cool thoroughly, discarding the parchment. 2. Be sure to use a good-quality parmesan cheese, as the flavor really shines here.